Seamless availability interface between RDP and Windsurfer. 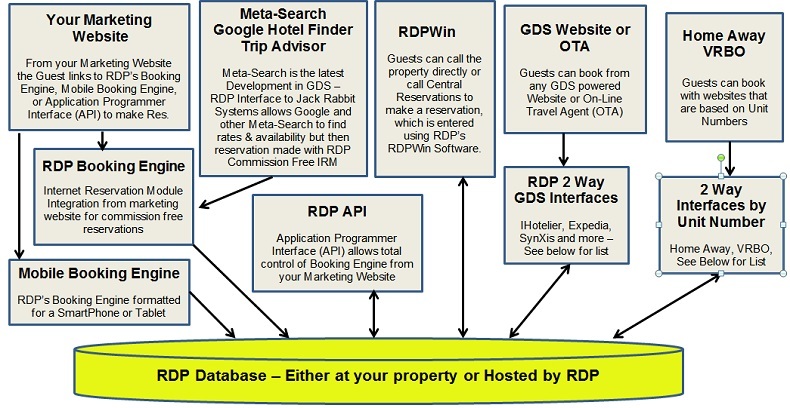 Properties with a two-way availability interface increase their GDS reservations significantly. Automatic loading of reservations booked through Windsurfer into the RDP software. Rate interface between RDP and Windsurfer. Manage rates in RDP and they will be updated on all your distribution channels. Distribution of inventory to online travel agents such as: Expedia, Travelocity, Orbitz, etc. Distribution of inventory to traditional travel agents. Use of their website booking engine with add-on selling and other key selling tools. Account Management to increase effectiveness of selling online. Why Use the Windsurfer Interface? Increase revenue by having true last-room availability open to the Windsurfer distribution channels, or manage a Windsurfer room block within the RDP Software. Reduce manual data entry by having reservations loaded automatically into RDP via the Windsurfer system. Contact Windsurfer for a Reservation Service Agreement for their GDS services. Please contact Windsurfer regarding pricing. Ensure you are on the latest version of RDPWin 2.x or 3.x. The only other requirement for all two-way interfaces is the property must not be using RDP-DOS for reservations. Contact RDP to purchase the Windsurfer interface.